This book examines the encounter between Impressionist painting and nineteenth-century consumer culture. Ruth E. Iskin explores the representation of feminine fashions, consumers and sales-women in Parisian boutiques. She revises our understanding of the representation of women in Impressionist painting by refocusing the exploration of gender, from women's exclusion from the public spaces of modernity to their inclusion; and from the privileging of the male gaze to a plurality of gazes that includes women. Iskin also analyzes how paintings represent women as objects of display, and how they address women as spectators in active roles - as consumers, producers or sellers - in a range of sites, such as the millinery boutique, the theatre, opera, cafe-concert and market stall. Considering a wide range of sources from nineteenth-century literature and visual culture, Iskin re-situates Impressionist painting in the context of the culture of consumption. 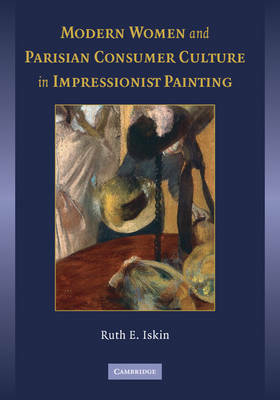 "Ruth E. Iskin explores the complicated relationship between Impressionist paintings and the burgeoning Parisian consumer culture in which they were created, writing about fine artists and their fascination with the mass-made object. She charts the evolution of a symbiotic relationship between commercial and fine art, in which we can also situate Marcel Duchamp's readymades of the 1910s, and which arguably reached its ultimate conclusion in Andy Warhol's Campbell's Soup Cans paintings of the early 1960s. Iskin challenges us to find new ways of understanding Impressionist paintings and in particular the complex relationship between women and consumer culture that they construct... This book would be of interest to anyone interested in or studying art history, social history, or gender issues in the nineteenth century. Iskin succeeds in adding new angles to the discussion in an already-crowded area of academic discourse... Iskin's study excels in making us rethink traditional gender paradigms of the late-nineteenth-century Parisian visual market." --Kiri Bloom, 19: Interdisciplinary Studies in the Long Nineteenth Century, no. 7, October, 2008. "This is a thought-provoking book that introduces many new ideas and makes new connections... It is an important resource for scholars of social, cultural, and art history as well as gender studies of the nineteenth century, while the extensive notes and works cited sections will be a valuable asset for studies of all types of consumer culture in Paris." --Charlene Garfinkle, H-Women, H-Net Reviews. March, 2009.